Philippe Karsenty: "We Need to Expose the Muhammad al-Dura Hoax"
Philippe Karsenty is the founder and president of Media-Ratings (www.M-R.fr), an online French media watchdog. In November 2004, he published an article entitled "Arlette Chabot and Charles Enderlin Must Be Fired Immediately," alleging that France 2, the television news station for which Chabot and Enderlin worked, violated journalistic standards by airing footage depicting as fact the alleged shooting of Muhammad al-Dura, a 12-year-old Palestinian boy, by the Israel Defense Forces (IDF). The Dura tapes showed a 12-year-old boy crouching behind his father while only one bullet whistles and pops in the background; it is clear now that during the fifty-five seconds of aired footage, the boy was not fired at and that, at the end of the film, he remained alive. Karsenty claimed the footage was staged by Palestinian cameraman Talal Abu Rahma, who staged similar scenes elsewhere in the eighteen minutes of the tape that Karsenty viewed. After France 2 aired the clip as fact and then distributed the footage for free, other networks rebroadcast it. The death of Dura at the hands of the IDF became a cause célèbre throughout the Muslim world, inspiring violence and anti-Semitism. In the article, Karsenty also announced his readiness to defend his claims in court. Chabot and Enderlin subsequently sued Karsenty for defamation in a French court of law. The French court, against the recommendation of the public prosecutor who had argued in favor of Karsenty's free speech rights, initially ruled in favor of Chabot and Enderlin and ordered Karsenty to pay a symbolic fine of one euro to each plaintiff, as well as a 1,000 euro fine and 3,000 euros in court costs. 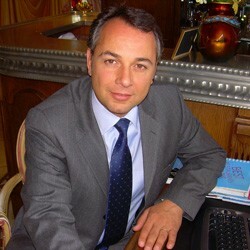 In September 2007, the Eleventh Chamber of the Appeals Court of Paris heard Karsenty's appeal. The judge demanded that France 2 turn over the twenty-seven minutes of raw footage. Enderlin, however, claimed he was not in possession of the rest of the tape. Three French journalists who were invited by France 2 to see the footage testified to seeing twenty-four minutes of film preceding the footage of Dura, in which young Palestinians are performing for the television cameras, falling and getting up when they think that no one is watching. In the end, only eighteen minutes of the entire tape were shown in court, and none depicted Dura being killed. In fact, at the end of the footage shown in court, the boy is still clearly alive. Karsenty won his appeal on May 21, 2008. Brooke Goldstein conducted this interview with Karsenty in two parts, the first in New York City on October 4, 2007, and the second, by telephone on May 27, 2008, after Karsenty's victory. Middle East Quarterly: What specifically led France 2 television to sue you for defamation? Philippe Karsenty: The defamatory words were that the Muhammad al-Dura tapes are fakes, a hoax, that Charles Enderlin was misled, that he misled people, and that he should resign. MEQ: What is defamation under French law? Karsenty: Under French law, defamation is the inability to prove the truth of a statement at the time the statement was made. This means that even if France 2 apologizes now and admits fault, I could still not win my case because the court could determine that when I published my statements, I didn't have enough evidence to assert that what I was saying was true. This is an absurd system of law. MEQ: So truth is not a defense to defamation? Karsenty: Yes, truth is a defense to defamation, but it has to be a truth known and proven at the time the claim was made. The burden of proof is on the defendant's shoulders. If the Israeli government had sued France 2 for defamation, for example, the situation would have been reversed: France 2 would have had to defend its slander rather than accuse me of defamation. MEQ: Why don't you sue France 2 for defamation or fraud? Why are you on the defensive? Karsenty: That case had to be undertaken by the Israeli state, which did not take this opportunity. Shurat Hadin, an Israeli public interest law firm, tried to take away the press credentials of France 2, but the Israeli government refused, and the Israeli Supreme Court has yet to deliver a verdict on that case. Karsenty: Because the Israeli government, apparently, would rather appease its enemies than fight back. MEQ: Could you file a lawsuit against France 2 for defamation against you and against the State of Israel? Karsenty: Under French law, I wouldn't have standing since I was not the one who was defamed. MEQ: In your first trial, the judge felt that there was no need to enter the Muhammad al-Dura tapes into evidence. What does this say about the right to discovery in French courts and their due process rules? How is the judge supposed to determine anything about the tapes if he does not care to see them? Karsenty: The court said that since I hadn't seen the tapes at the time, the court should not take them into account. True, I didn't see the tapes, but I knew people who did and who told me of their content, which is why I felt comfortable coming to the conclusion that I did. MEQ: Your conclusion, however, was based on hearsay. Karsenty: My first conclusion was based on what I saw from the France 2 news report on Muhammad al-Dura, on allegations by Nahum Shahaf [an Israeli physicist and reservist with the optical intelligence unit of the IDF], and on my subsequent investigation. What they aired to the public was ridiculous. In those minutes, Muhammad al-Dura showed no agony, and none of the actors were hit by any bullet. MEQ: You said that the majority of the twenty-seven minutes not initially shown to the public are rushes and staged scenes. Laurence Trebucq, the new judge on appeal, ordered the tapes released but only within the court. Why doesn't she release the images to the general public? Karsenty: We don't know yet. MEQ: In the ruling against you in the lower court, the judge went against the recommendation of the public prosecutor who said there was no evidence that you acted with personal animosity, but the judge also seemed upset when he read the judgment against you, and he awarded the plaintiff very little. What does this say to you? Karsenty: That the judge may have felt uncomfortable, received orders, and was not proud of what he was doing. MEQ: Received orders from whom? Karsenty: Perhaps instructions or advice from the justice minister or the people around him. By the way, the judges have no expertise in forensic science or ballistics, nor did they draw on any such expertise. MEQ: Are you saying that the French courts are not independent judiciaries? Karsenty: I am not saying that all judges are not so independent. All I am saying is that if you read the verdict that was published two years ago, it seems that it is not really an independent judgment. MEQ: Was there corruption in your case? Karsenty: Not at all. You don't need to buy people who are completely brainwashed. Charles Enderlin is like the capo di tutti capi; he is a godfather: he is a moral authority. I went against a case defended by the biggest guy in the Middle East journalism corporate world. Enderlin even used to give advice to diplomats. Let me give you an example: A French journalist told me that when Dominique de Villepin was foreign minister and went to Jerusalem, he gathered all the French correspondents at the embassy, and before his speech, he said, "What does Charles think?" It's unbelievable. MEQ: So Charles Enderlin is the conscience of France when it comes to the Middle East, and you offended their conscience? Karsenty: You said it, not me. MEQ: Who is funding your case? Karsenty: I funded it myself. I used to be a stockbroker, and then I began doing financial consulting with companies. I have also received honoraria for speeches in the United States. MEQ: Other people have also said that the Muhammad al-Dura tapes are forgeries. Why did France 2 target you and only you? Karsenty: Yes, Gerard Huber has said that; James Fallows said that the boy was not killed by the IDF, but he did not say that the incident was staged. The reason they targeted me is because at the time I published it, I had credibility through Media-Ratings [the media watchdog group Karsenty founded in 2004], and I had been invited to give comments about all sorts of topics and media inaccuracies. What Happened to Muhammad al-Dura? MEQ: There are different theories about the fate of Muhammad al-Dura. Some say he was killed by the Palestinians, and others say he is alive at the end of the tape but are not clear if he is alive now. What is your version of the incident? Karsenty: We shouldn't talk about theories but about facts and evidence. At the end of the France 2 film, the boy is not dead. He is raising his elbow and looking at the cameraman. These images are available on Richard Landes' website and on Youtube. If you look at the images, you will see that the boy is clearly not dead. There are no bullet wounds or blood. Those images were never broadcast in France, but they were shown in England on the BBC and in Arab countries. What amazes me is that nobody said, "Wait a minute. There is a problem here." It doesn't make sense. In a news report done one year after his son's alleged death, Dura's father says the first bullet hit his son on the right knee, but the tape shows not a single drop of blood there; it is ridiculous. Nothing makes sense in his version, but nobody wanted to look at the images. MEQ: Circumstantial evidence tends to support your case that the Muhammad al-Dura incident was a staged blood libel. For example, CNN refused cameraman Talal Abu Rahma's initial offer to sell the tapes because he would not guarantee them as real. The twenty-seven minutes of rushes looked staged and rehearsed. A Reuters cameraman recorded Rahma filming other staged events. On what basis did the lower court decide against you? Karsenty: The Israeli government's refusal to question the tapes was important. The court had a letter from [then-]French president Jacques Chirac praising the journalistic integrity of Charles Enderlin. We both had witness testimony, but the plaintiffs brought Palestinians who testified that the Israelis shot at the father and son with planes, helicopters, and antitank missiles although there was no evidence of any of this on the tapes. Although the plaintiffs' witnesses sounded ridiculous, the judge said, "They testified, and we shouldn't dismiss it because they are Palestinian. They were there, and you were not." MEQ: Why did Chirac write a letter to the court on behalf of Charles Enderlin? Karsenty: Chirac wrote a letter commending Charles Enderlin and his attention to accuracy in his latest book. Chirac's team knew this letter would be used at the trial, but the letter was not directly about the Muhammad al-Dura footage. Chirac did this to further his idea of France's politique-arabe. MEQ: After the lower court ruled against you—in part because the Israeli government did not come to your defense—the IDF wrote to Charles Enderlin requesting that he hand over the footage and saying that the court's statement was not an accurate reflection of the IDF position, and that they wanted to see the tapes. Was this a reaction to the court's decision or a 180-degree shift in Israel's public relations position? Karsenty: We had been working desperately to get this letter from the IDF. MEQ: What contributed to the change in Israeli governmental policy towards you? Karsenty: When the government was fighting such a difficult campaign on the ground, it just wanted to put the Muhammad al-Dura affair behind it. But lies endure. If the good name of Israel is besmirched in this case, it will haunt the country for generations. Note that millions of people continue to believe in the anti-Semitic forgery The Protocols of the Elders of Zion. Muhammad al-Dura postage stamps already exist in Tunisia, Egypt, Iran, and Jordan. Squares in Morocco and Mali and streets in many cities are named for Dura. Daniel Pearl was beheaded with the image of Muhammad al-Dura behind him. We need to expose the Dura hoax now so our children needn't suffer for this lie. MEQ: It's obvious that Jerusalem should respond. Why doesn't the Israeli government do something now? Karsenty: Some people who weren't in the Israeli government at the time the mistake was made used their absence as an excuse: "Since we didn't do it, it's not our responsibility to fix it." For others, it's a question of ego. They don't want to admit that they made a mistake in the first place. MEQ: Why is Daniel Seaman, director of the Israeli government press office, not listening to the public interest law firm Shurat Hadin and stripping France 2 of its press credentials? Karsenty: Seaman is a great guy; ask him. You can imagine how much pressure the Israeli establishment has put on him. MEQ: Do you think Israel and the United States are losing the information war? Karsenty: What war? They've already lost because they didn't even bother to fight. MEQ: Is there any media accountability in France? Is there any independent monitoring? Karsenty: They have a mediateur [ombudsman] working between France television and the public. When I called him, he covered up the lie but was then replaced four years later. I called his replacement, who at first was excited to meet me but later called to say his boss forbade the meeting. I met perhaps twenty people at France 2, from the very bottom to the very top, before the case came to court. MEQ: What prevents someone at France 2 from destroying the tape? Karsenty: I don't know if anyone besides France 2 has copies. Someone from Fox News compared this to the Nixon tapes. The odd thing is the Nixon tapes also had an eighteen-minute gap. It is going to be huge when we confirm that international media used staged and fake footage. When the truth comes out, it will be devastating—that is, if the truth really does come out. Rather than accept responsibility, France 2 may say that I did make my statements in good faith but that I didn't prove the tapes were staged. This may be how they sweep this episode under the rug. MEQ: Do you think that the French media seek to appease the local Muslim population? Karsenty: The media go well beyond appeasement to incitement. MEQ: You are saying France 2 actually sought to incite violence against the Jewish population by airing the Muhammad al-Dura tapes? Karsenty: Yes, it used this as a form of pressure on Israel. Chirac used the French Jews as hostages. He seemed to say to the State of Israel, "I have 600,000 Jews in France, and if you don't behave correctly towards the Palestinians, we will show this footage and the Jews of France will be assaulted." MEQ: Do the French people think that this is just your issue or just a Jewish problem? Do they see the larger implications? Are they not insulted that their media is lying to them? Karsenty: For the French, if it's in the newspaper or on television, it's true. But thanks to this story, things are changing. MEQ: The French media consistently ignores your case. Why? Karsenty: I call France the "little U.S.S.R." The difference between the Soviet Union and France, however, is that the Soviets knew they were being lied to while the French think they know the truth. MEQ: Will Nicolas Sarkozy's presidency change the situation? Karsenty: He is now responsible. France 2 is state-owned television, which makes Sarkozy its owner. He should have France 2 apologize to the world. I brought him all the documents in 2005. I met two of his advisers in April 2008, who agreed that the incident was fully staged. But Sarkozy hasn't responded to date. MEQ: How independent is the French media? Karsenty: Everyone in the private media depends on the state in one way or another, which explains why they refused to report on my trial, even after foreign media began to cover it. When it comes to foreign policy, there is no independence in either public or private media. MEQ: Do you think the broader press knows they are guilty of over-reliance on Palestinian fixers? Karsenty: Yes. But it would be revolutionary for them to admit that they are dealing with fixers who are liars. It is the same thing in Iraq and in most Middle East countries. MEQ: Was there any variation in how the French press covered the case, in what little they did cover? Karsenty: Most of the media have been against me. The biggest weekly in France, the Nouvel Observateur, issued a petition to support Enderlin's lies. Guess what? Hundreds of journalists, personalities, and simple people signed it. MEQ: Why does the French media have not only an anti-Israel and anti-U.S. agenda but also a pro-Arab agenda? Karsenty: The French don't like Arabs at all. The proof? They mistreat them in France, but they feel guilty for the way they treated them in the colonies. MEQ: Do you sense hostility to Jews? Karsenty: Yes, the French will never forgive Jews for exposing French collaboration in the Holocaust. This is one motivation for depicting Israel as a Nazi state. It is the French way of saying "We behaved no worse than the Jews do now." It helps the French feel less responsible for their collaboration with the Nazis. MEQ: What do you think is the future of French news reporting now that France is launching a CNN-like 24-hour news service? Will this network improve French journalism? Karsenty: No. That would require a major cultural change. It is ironic that the French media complain about U.S. journalists embedding with the U.S. military in Iraq but don't recognize that they themselves have been embedded with the French government in Paris. There is certainly an incestuous relationship between the media and political individuals in Paris. MEQ: You recently won your appeal? Karsenty: Yes, we won the case completely; the court decision was clear. The court, however, did not have to rule that the tapes were staged but, rather, said that I could publish what I wanted because I had evidence that it was staged. The written arguments say that I am right, yet all of what the court said intrinsically supported my statement that the incident was staged. MEQ: Did you get any award for damages, costs, or attorney's fees? Karsenty: No. The whole process cost me money. Karsenty: Under the French system, I had to pay success fees to the lawyers, and I liked that. But because of the Israeli government's horrible reaction and attitude, I decided this will be my last fight for Israel. France 2 is even now appealing the verdict to the Supreme Court. Karsenty: The Israeli ambassador and other diplomats don't want this victory. The spokesman for the Israel Ministry of Foreign Affairs said that I was a private individual and that the Israeli government didn't ask me to take on this battle, and so I had no right to ask that Israel come to my aid. MEQ: Has any French media covered your success? Karsenty: At the beginning, no, of course not, but The Wall Street Journal had a huge piece on it. There was also a short article in Le Monde. Le Monde said that France 2 had lost but not that I had won. There is a difference. And now, Le Figaro published one editorial piece and a confidential note. And we're expecting more to come. MEQ: What do you think the effect of this decision will be on France 2 and French reporting on the Middle East? Karsenty: Very little, because the French media is still covering up the lie and because the Israeli government doesn't want to use this victory to take a stand against the lies of the Western media. Things could change if Israeli diplomats were doing their job and if Sarkozy was doing his. He should force France 2 to admit to the fraud and apologize to the whole world. MEQ: What are the implications of your case for French Jews and Muslims? Karsenty: People who really care about the Arabs see that I am pro-Arab. Who suffers most in this war with Israel? Arabs. Incitement creates hatred. Chirac was not a friend of the Arab people; rather, he was their worst enemy. He was the best friend of Arab dictators because of business and political deals. Telling Arabs to stop wanting to die for lies helps them to have a better life, and this is also what I tried to do. The Muhammad al-Dura tapes were a lie that created much hatred and violence, contrary to the interests of Arab peoples. MEQ: Do you see your suit helping to guarantee freedom of speech in France? Karsenty: No. The French people don't care about this. They think they have freedom of speech because they live in a country where they are allowed to say Chirac is silly. They don't realize how uniform acceptable speech is on foreign issues. MEQ: Have you considered a defamation suit against Charles Enderlin? Karsenty: Many people and media outlets defamed me in order to influence the course of justice. I was thinking of suing them, but what is the point? The bottom line is that when I won the trial, instead of winning compensation, I was saddled with legal bills from my lawyers. For these past six years, I have taken physical risks, and it has been exhausting. If I sue them, it will just consume more time. I want to go back to business. And I also respect my adversaries' freedom of speech even when it means they're defaming me. We shouldn't fight defamation through lawsuits but with the truth. Karsenty: Ultimately, the case will not be solved in a court; it will be solved politically. MEQ: In the court of public opinion? Karsenty: No, by Sarkozy. He has to do something. Otherwise, I may have to undertake a campaign to show that Sarkozy doesn't want to reverse the state-sponsored anti-Semitism that Chirac initiated. "France 2: Arlette Chabot et Charles Enderlin doivent être démis de leurs fonctions immédiatement," Media-Ratings, Nov. 22, 2004. The Jerusalem Post, May 21, 2008. "Arlette Chabot et Charles Enderlin," Media-Ratings, Nov. 22, 2004. "France 2 Counters Accusations with Lawsuits," Committee for Accuracy in Middle East Reporting in America (CAMERA), Boston, Jan. 18, 2007. Denis Jeambar and Daniel Leconte, interview on French radio station RCJ, Feb. 1, 2005, in "Backgrounder: Mohammed al-Dura, Anatomy of a French Media Scandal," CAMERA, May 21, 2008. JTA News Service, Nov. 15, 2007; Israel News Agency, Nov. 21, 2007; "Backgrounder: Mohammed al-Dura." Associated Press, May 21, 2008; The Jerusalem Post, May 21, 2008. Gerard Huber, "Misère de journalistes, misère de républicains," June 14, 2008, accessed June 24, 2008. James Fallows, "Who Shot Mohammed al-Dura?" Atlantic Monthly, June 2003. Richard Landes, Al Durah: The Birth of an Icon. What Happened? accessed June 24, 2008; "Al Dura Affair: The 10 Seconds Never Shown by France 2," Youtube, accessed June 24, 2008. "Personal Testimonies, Jamal Al Durra," transcript of online discussion on Arabia.com, Oct. 30, 2000, Addameer.org. Chirac to Enderlin, Media-Ratings, Feb. 25, 2004, accessed June 11, 2008. The Jerusalem Post, Sept. 17, 2007. "Appel: Pour Charles Enderlin," Nouvel Observateur (Paris), June 23, 2008. The Media Line (New York), May 29, 2008. Nidra Poller, "A Hoax?" The Wall Street Journal, Europe, May 27, 2008; "Al-Durra Case Revisited," The Wall Street Journal, Europe, May 27, 2008. Le Monde (Paris), May 24, 2008. Ivan Rioufol, "Les médias, pouvoir intouchable?" Le Figaro (Paris), June 13, 2008. Related Topics: Arab-Israel conflict & diplomacy, Media, Palestinians | Fall 2008 MEQ receive the latest by email: subscribe to the free mef mailing list This text may be reposted or forwarded so long as it is presented as an integral whole with complete and accurate information provided about its author, date, place of publication, and original URL.